Last year, my blog was seriously neglected in the whirlwind of making, teaching and selling; all I can say in my defence is, looking back through my year-planner, I genuinely don’t know how I did it all! – but I’m going to make sure I shuffle things round to create more time for the website this year . . . I do enjoy being here. 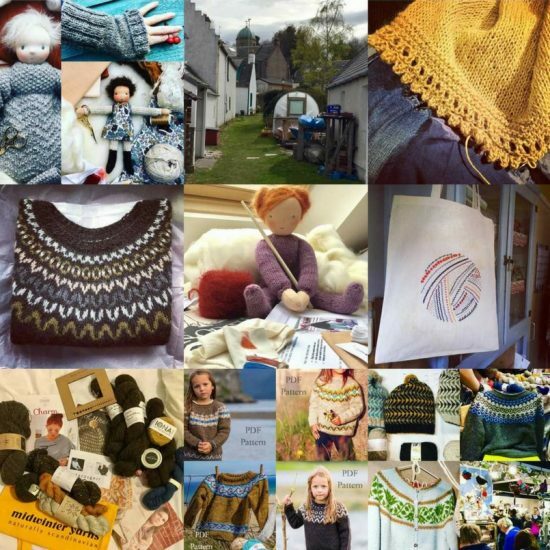 Instagram is just so immediate that what I have posted has gone on there, but there’s nothing like writing a blog post for making you reflect on your practice – time well spent, I reckon. These are just the pictures that people liked the most on Instagram; but they do give a pretty good impression of where my energies were concentrated last year! 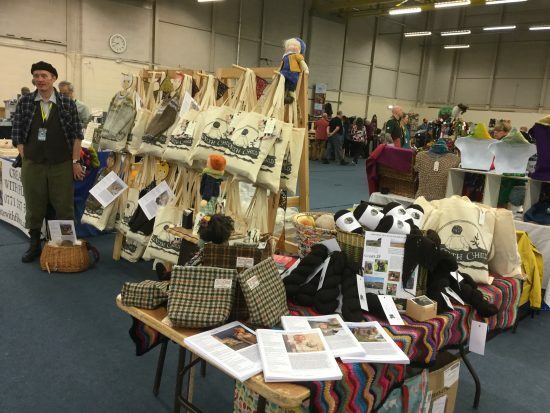 It’s no accident that there are a few fond memories of Edinburgh Yarn Festival featured here. 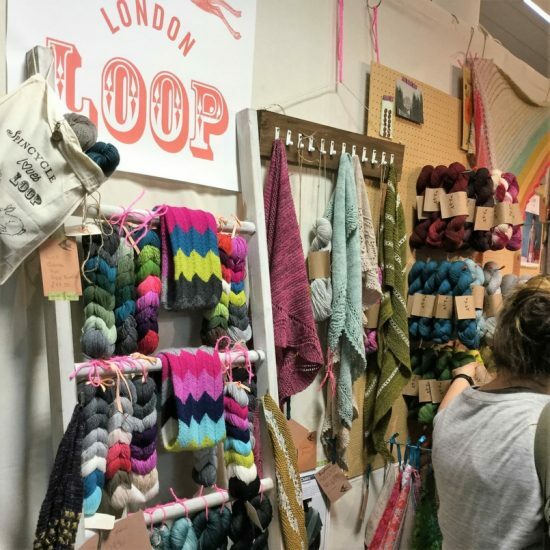 If you love knitting, crochet, weaving, spinning, and all the associated treasury of project bags, needles, roving and notions, and you haven’t yet been to EYF, then go! GO!!! Take my ticket for Saturday, because I bought it in denial of the massive probability that I wouldn’t be able to travel the 200+ miles by public transport after work on a Friday night from my tiny and relatively remote corner of the world, which is of course true. 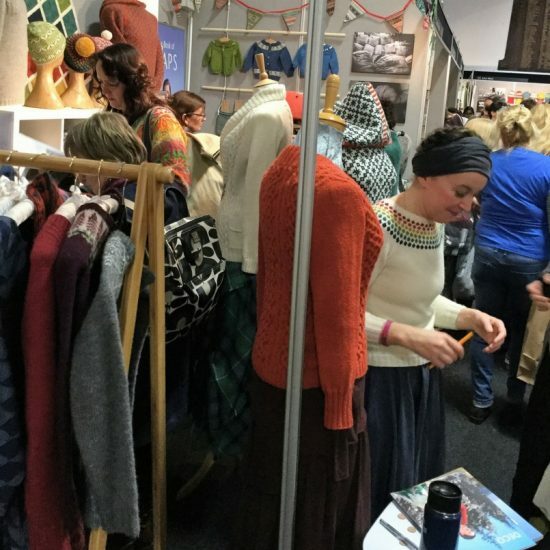 Can’t believe I won’t be there, after looking forward to it since last March when EYF 2017 ended – but I’ll be keeping up with all the gorgeous shenanigans online, and remembering 2017 highlights such as Knit Night, a wonderful Knitsonik workshop, the utterly staggering Marketplace and most of all the people, many of whom are now friends. 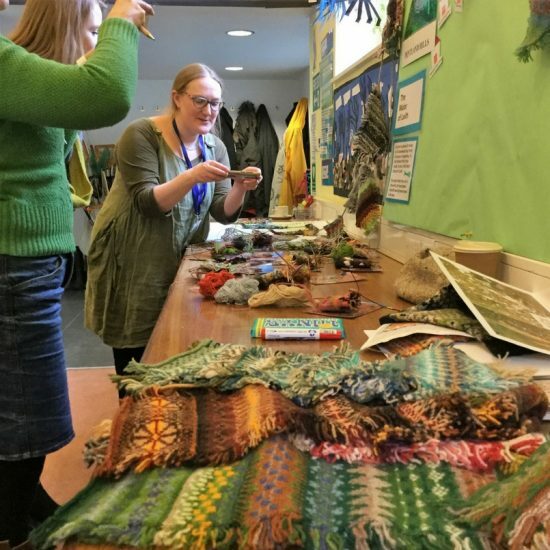 Teaching workshops was another big part of 2017 for me, and one which I was glad to return to after a two-year break. I launched a whole new workshop programme for Yarn Festivals, which reflected the shift in focus my creativity has taken since North Child: I taught around the processes involved in lopapeysa construction – knitting in the round, magic loop technique, grafting, yoke pattern design, stranded colourwork – because these processes had filled my head so intensely while I was working on my children’s lopapeysa designs. It is very true that if you want to properly learn how to do something, you should teach it; my lovely students brought a whole new dimension to my understanding of the design process. 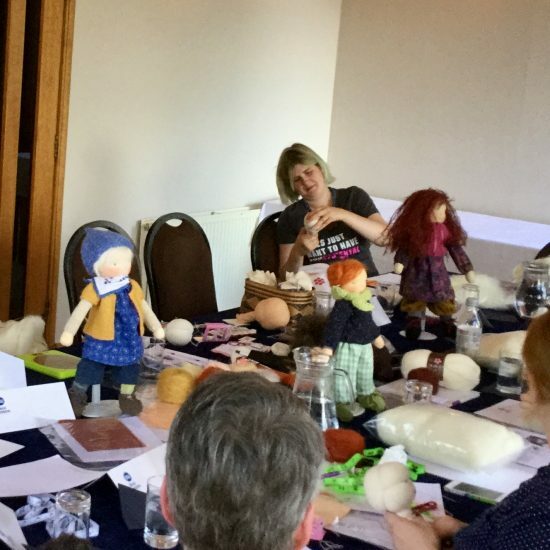 And something else kept popping up, although it had never really gone away; thanks to a request from Loch Ness Knit Fest, I began again to teach Waldorf doll-making. 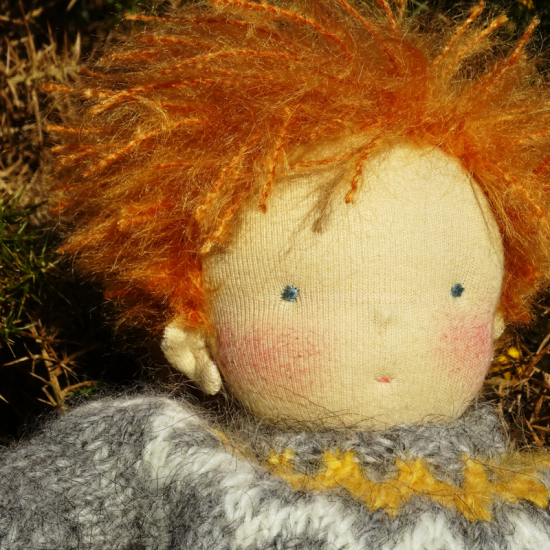 Preparing workshops for Yarn Festivals resulted in a brand new doll pattern, and then two variations – and eventually, written and photo tutorials and doll-making kits, which are now in my shop . . . more of this coming up on my Dolls page! It was wonderful to have these “Tibby”doll kits leaving the shop in the run up to Christmas, and to know that some little people would be getting special handmade gifts! But that was weeks ago – and Christmas already seems long gone, although there’s plenty of fresh snow and the mountains are white to ground level. It’s a new year, and I have new plans for 2018 which are keeping me busy and excited for the Spring and beyond; I’ll be posting an update here as soon as I can. childrens’ designs, both of which I’m more than happy to address! More about accessories later; but my daughter Iona asked for a Christmas sweater and Heima was her choice. She wanted a loose, “sloppy Joe” shape – a pretty classic lopapeysa really, but maybe a bit more boxy. The yoke pattern for Heima was based on a sunflower, and became one of the impressive, leggy ones grown by Gustav Klimt and my friend Vicky at Balnacra Arts this Summer. I kept the main colour of peaty undyed-black lettlopi, but subtly altered the yoke palette to a more grown-up suggestion of grellow . . . I couldn’t resist pulling in another of the beautiful lopi greys. It’s a lovely feeling to make a gift that you know will be worn over and over. The adult Heima turned out just as I planned it and looks perfect on Iona (more pictures coming soon). . . the pattern will be going out for testing soon, so watch this space for updates. Still a few more making days left before Christmas. . .
Now that the final posting dates for Christmas delivery have arrived, the flurry of activity in the shop has died down. I still have more gift knitting to finish than I would have liked at this stage, but I’m going as fast as I can and loving every stitch of this adult-sized Heima. When that’s been blocked, wrapped and given with love, the crackers have been pulled and the pudding is going down, I plan to bash out a couple more hats for the Pussyhat Project before the deadline of January 14th – cerise yarn ready and waiting. 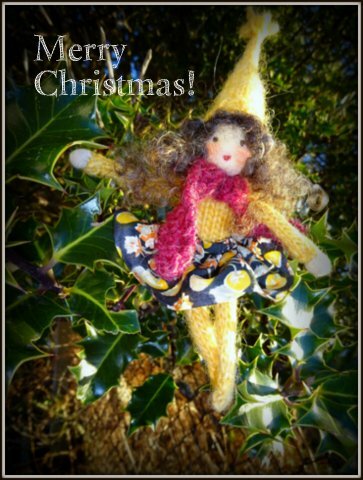 The plan for tomorrow though is wrapping, parcelling and knitting, interspersed with bouts of decking the, ahem, halls. Today we acquired a small, fat Christmas tree, in scale with the house and two of the cats, and by the end of tomorrow it should be a lot sparklier. I work 99% of my knitting in the round, and like a good Elizabeth Zimmerman fan I often make a swatch cap, or a mitt, instead of a standard swatch-in-the-round. Plus-side being, you get to wear your swatch afterwards; although beware of over-indulging in your swatch-accessory, and then having to play yarn chicken. Never a good feeling. The other swatch/project I’ve been known to make is a doll-sweater. Of course, the difference in scale between this and your planned human-sized garment means that the doll wears a “chunky knit” version, but it can give a good idea of colour combinations, especially with a little head popping out of the top. And the doll-clothes reserve has one more item added! 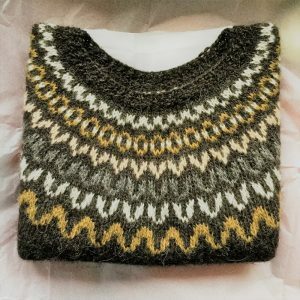 It’s always good to get feedback, and lovely to have had so many requests for adult-sized North Child sweater kits. I’ve started designing these already and I’m planning to tweak them a little, shape- and detail-wise; samples in progress and looking interesting!